During the 1900’s, evangelistic meetings were frequently held in tents around the Aldborough area. One of these tents was pitched on “Dewings Meadow” at Thurgarton. The Christian message was powerfully proclaimed, urging people to turn from their old way of life to a new one in Jesus Christ. Those who confessed faith in Jesus were persuaded by scripture to be baptised by total immersion. This shows symbolically the death of the old life and resurrection to a new one. The service was conducted in the river at “Aldborough Mill“, the water being dammed up to a depth of three feet. The Brethren Assembly came into being to enable the believers to worship in a way thought to be more in line with the behaviour of the “early Church” as recorded in the Bible. To begin with, a small company met in the front room of John Harvey’s cottage which was next to the building known as Kent’s Shop. The Gospel Hall was constructed around 1910, on part of John Brown’s garden, by William Forster. Because of its corrugated iron construction, it was later affectionately known as “The Tin Hut”. On Sunday mornings the members would meet together for a time of open worship where they would remember Jesus’ death with bread and wine. Their intention was to stick as closely as possible to Jesus’ command at the last supper, and the example of the early church in the Book of Acts. The Evening Service was evangelistic, (The Gospel Service), where the message of Christ was preached and many came to faith and trust in Him, as a result. Later, a Sunday School was started along with other youth work as the church grew. For some years it was felt among the Christian believers that a new building was needed which would be more fitting for worship, and more user friendly. The new building plan was launched in faith and after much sacrificial giving the construction was completed. 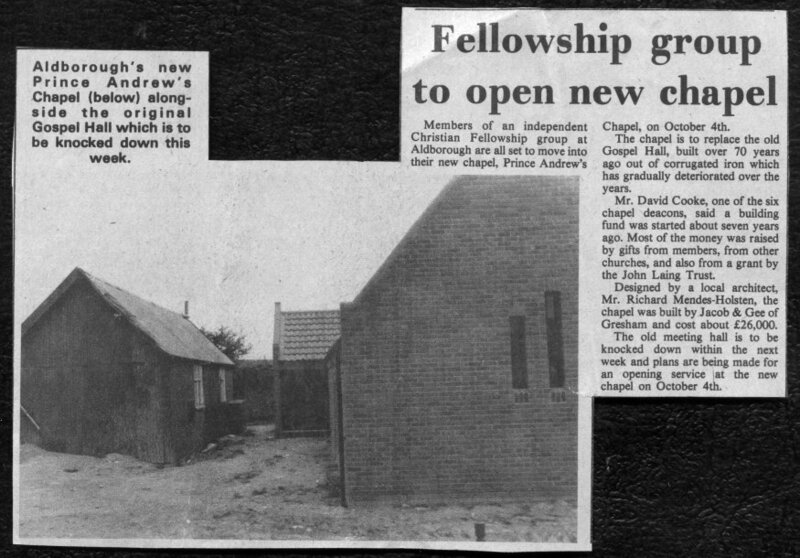 Prince Andrews Chapel opened in 1980 replacing the old “Tin Hut”,(On the left of the picture below), which had stood where the car park is now. It is dedicated to the Glory of God and the increase of His Kingdom. Click here for more pictures of the build.